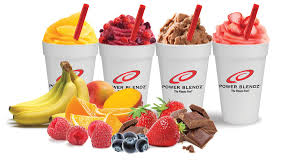 Power Blendz Shakes and Smoothies taste amazin. There is one for just about anyone's fitness goals and taste profile. Combining Premium fruit with the finest supplements, Power Blendz leads the industry in taste and functionality. Power Shake - premium, tasty and nutritious meal replacement. It's a highly balanced and nutrient dense shake blended with many of your daily basic vitamin and mineral needs. This smoothie is a staple and is recommended as a healthy meal replacement and post workout option. Pure Protein - has a higher protein to carb ration and is a good solution for those who are looking to add lean muscle. Pure Protein does not have the added vitamins or minerals of the Power Shake, but ounce for ounce, has less carbs and more protein. It is an excellent choice to boost your protein intake and help fuel recovery. Carb Cutter - is our lowest carb and calorie option for those looking for the highest level of protein with the lowest number of carbs. Muscle Builder - is a high-calorie, highly nutritious shake for those looking to pack on muscle by adding higher levels of muscle fueling carbs and protein to their diet. It's designed to help gain muscle or size. Fat Burner - is our meal replacement shake infused with fat attacking supplements. The Pure Pyruvate and Chromium Picolinate added to the Fat Burner are not stimulants, so they help to facilitate fat burning without the added stimulant side-effects commonly associated with fat burning products. Energizer - this shake has some serious get up and go. The Shredder 7x added to the Energizer meal replacement provides a powerful combination of stimulants and thermogenics designed to kick your day and your fat burning into high gear. It's ideal for anyone wanting a seroious jolt of energy and wanting to do it nutritiously. Slim & Tone - is a delicious reduced calorie protein shake with added Fiber Fuel, designed to slim and tone. Great for post workout, a small meal or in between meal snack. Power Greens - Power Shake meets vegetable smoothie. Organic wheatgrass and a nutrient dense vegetable blend that includes kale, broccoli, cabbage, oat grass and alfalfa leaf. Power Blendz Juice Bar is open to the public! Our Personal Training Staff can customize a diet just for you. Rule 1: Eat 4-6 small meals per day. Increase the amount/volume of food you eat during the day without increasing the calories by eating foods with more water, fiber, and protein like fruits, vegetables and lean meat. Rule 2: Do not eat past 8:00 PM. Sleep helps to release human growth hormone(HGH) which is a powerful fat burning and muscle building hormone. Rule 3: Use the bite rule for starch and sugar. The major trigger for fat storing insulin release is starchy foods and sugar like bread, pasta, potatoes, cookies, crackers, rice, etc. Limit starch/sugar intake to 3-10 bites a meal. Rule 4: Eat the right fats. Certain fats like omega 3 from fish and grass fed animals actually can turn on fat burning genes by interaction with cell receptors called PPARs. Rule 5: Eat protein at every meal. Protein releases the fat burning hormone glucagon which directly opposes the action of insulin and help burns fat. It also aids in muscle gain and helps you feel less hungry. Rule 6: Use bars and shakes for quick meals. These should be used as small snacks in between meals to decrease hunger, provide building blocks for muscle, and stabilize energy. Rule 7: Learn the Metabolic Effect Label Rule. If you subtract the fiber and protein from the total carbohydrates on a label, the total should equal ten or less. The lower the number, the better. Rule 8: Avoid foods that increase hunger. Coffee, synthetic sweeteners, and sweet snack foods increase hunger because of their effect on stress hormones and insulin. Rule 9: Always eat breakfast. The biggest mistake you can make in the morning is not to eat, as you will soon find out yourself on a roller coaster ride of cravings, hunger, and dips in energy all day. Rule 10: Never let yourself get hungry. Once you let yourself get hungry, all bets are off. Eat every 2-4 hours and eat before you feel any desire for food.